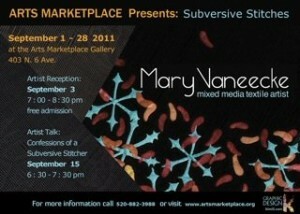 The show is up and here is your invitation to see Subversive Stitches at Arts Marketplace. The opening reception will conveniently be held Saturday, Sept. 3 from 7-8:30 pm. That is during the First Saturday Arts Walk in the warehouse district. It is also Labor Day weekend, but do stop by if you can. Arts Marketplace is at 403 N. 6th Ave. south of 6th St. across from Miller’s Supply. No need to RSVP. All are welcome to attend. I will also hold an artist lecture Confessions of a Subversive Stitcher on Thursday, September 15 from 6:30-7:30 at Arts Marketplace. It will be fun. Hope you can make that, too. Thanks, Diana! It’s going to be a fun night!